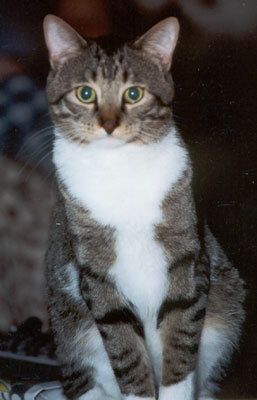 Our kitty, Shardik, escaped through our sliding glass door on October 11th. We tried numerous techniques to get him back, but in the end it was trapping accompanied by videotaping that returned him to us 25 days later. Using a video camera to monitor our patio we were able to determine that Shardik was visiting regularly. Videotaping also allowed us to know what time he usually visited, which food he responded to best, and how he was reacting to the trap. First, I should make it clear that I am NOT an expert on electronic devices. In fact, we do not own a video camera and before Shardik escaped I had never even operated one before. I borrowed the camera from my work and a co-worker told me that it was possible to record from the camera directly to a VCR. The advantage of this is that you can record for up to 8 hours. Unfortunately, my friend could not tell me how to set it all up. So my husband and I called Sony (the camera's manufacturer) and a gentleman there was kind enough to walk us through it. However, we still ran into a few problems and glitches. Anyway, I will do my best to describe the set up that finally worked for us and relay some other things that I learned about cameras during Shardik's big adventure. I hope that someone out there finds it helpful. The camera that we used was a Sony DCR-TRV 19. However, I believe that the set up that follows will work with any camera that has an audio/visual (A/V) out jack. This is the same jack that allows you to play tapes in your camera on your television. I briefly looked at some of the cameras at Wal-Mart yesterday and all of them had this jack. You'll also need two cables: the A/V connecting cable and an AC adapter. The AC adapter simply connects your camera to a wall outlet. It is unlikely that the battery on your camera will be able to supply 8 hours of power. The battery on the Sony only lasts 2 hours, at best. The A/V connecting cable connects your camera to your VCR. One end connects to the camera and the other end has 3 plugs. These are usually color-coded: the white and red are audio, and the yellow is video. The yellow plug should be plugged into the "Video In" jack on the VCR and the white and red into the "Audio In" jacks (the jacks, like the plugs, are usually color-coded). Some VCRs, including ours, have only one "Audio In" jack (ours is white). In which case you only plug in one of the audio plugs. Actually, audio is not likely to be important. So just make sure the yellow plug is in the "Video In" jack. (Some newer cameras and VCRs can be connected more simply with an "S video cable", but we didn't use this method). Now the VCR has to be set on the correct channel to record. This is VERY IMPORTANT. If it is not on the right channel you will not record. After everything is connected, turn on the camera, VCR, and TV (your VCR needs to be connected to a TV at this point  but you can disconnect it from the TV after the channel is set). Your VCR is probably on channel 2, 3, or 4. Hit the channel down button on the VCR or its remote until you can see the image from the camera on your TV. On our VCR the correct channel is called the "A/V in" channel, but this may be different on other VCRs. Also, make sure your VCR is on the speed that records for the longest (SLP on ours  Super Long Play). You should now be ready to go! You can disconnect the TV from the VCR, but DO NOT disconnect the VCR from its power source. If you do the channel will revert back to its default setting and you will not record. So, if you need an extension cord make sure that it's already plugged into it before you set the channel and speed. Now all you have to do is place the camera and VCR where you want them (be sure to use the camera's AC adapter), turn the camera and VCR on, put a tape in the VCR (make sure it's an 8 hour one if you want to record all night), and hit record ON THE VCR (NOT THE CAMERA). I know this sounds complicated, but it's not as bad as it sounds. However, as I mentioned earlier we did run into a few glitches. These may be unique to Sony camcorders, but I think I should mention them anyway. On Sony cameras, if there is a tape in the camera, the camera will turn itself off after 10 minutes of inactivity! Remember, you are recording with the VCR, and the camera doesn't "know" that it's recording  the camera thinks that it's inactive. So it's best to play it safe and make sure that there is not a tape in the camera. On the other hand, if there is not a tape in the camera, Sony camcorders will revert to "Demo mode" after 10 minutes of inactivity. However, you can turn this feature off. Regardless of the type of camera that you have, check your owner's manual and if there is a Demo mode, make sure it's off. I should also note that there are other options than using this elaborate set up. Many cameras are capable of doing interval recording. In this case, you record only at set intervals  say 10 or 15 sections. So you can squeeze a whole night on to a 2-hour tape. In this case, you don't need to mess with a VCR but I believe that you will still need to use the AC adapter with the camera. I've never tried this technique before so all I can suggest is that you consult your owner's manual or call the camera's manufacturer. When Shardik visited, he typically stayed longer than 15 seconds. Often he stayed for several minutes  so while it's possible you may miss your kitty if you do interval recording, I don't think it's likely. We were very lucky. Shardik was visiting our own patio and was usually 2-3 feet from our sliding glass door. Also our patio was well lit. In other situations you may need supplemental light. There are also cameras with infrared capabilities that film in the dark. In fact, the camera we used had this feature, although we didn't need it. In Sony cameras it's called "nightshot". When using this feature the camera's range is decreased (I think the owner's manual says that it is about 10 feet, at best). There are, however, cameras with better infrared capabilities and you can buy additional infrared lights. My advice here would be if you are planning on investing in a camera with infrared capabilities or on buying additional infrared lights, make sure you research them well. If possible test them out before you buy. What if You Don't Own a Camera? Again, we were extremely lucky to have access to a video camera. If you don't have one and you can't borrow one from a friend, you may want to look into renting one. I did some quick checking on the Internet and a number of rental stores, such as Rent-A-Center, rent camcorders. Unfortunately, none of the websites listed a price. My thoughts and prayers are with everyone out there who is still searching for their kitty. Questions on Video Surveillance? Looking for more video tips? Go here.